WarClicks is an incremental game where you train and upgrade your troops, manage and optimize your troop production and then fight your way through tons of battles to progress through the game. It is a game with unlimited progress potential and also idle game progression. It is a perfect fit for both players who like to constantly do something but also for those who like to play for short periods and still get a great experience! If you have never played a game of similar genre before, you should definitely try it out as there's something uniquely attractive to the special way these games are played! Tried it, it is addictive, yet poorly made, not as much effort could have been put into it by far. 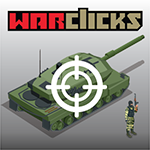 very very good game War Clicks!! Each day I enjoy more in this game. Game is full of hidden tasks that surprises you every time. I like how the game gradually increase. At the beginning you only have boot camp. But when you get the certain amount of troops, the war zone opens and that is when the real fun begins. It's a very fun to play game. I love how every day there is a new challenge and new tasks for you to finish.